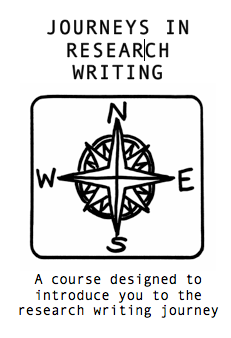 We invite you to sign up for our course Journeys in Research Writing. If you are thinking about doing postgraduate research or are in the early stages, this course is for you. It has been designed as a flexible resources to take you through the initial steps of writing about your research ideas. It is intended to take you five to six weeks. Every week will require you to do some writing which you share with others, working towards a chosen writing product by the end of the course. We estimate that you will need 2-5 hours per week, depending on how much you want to engage with resources and read each other's contributions. The course has been designed by an experienced team from the Centre for Higher Education (CHED) at the University of Cape Town. It deals broadly with key research skills, such as how to approach a research topic, do literature searches and make your writing hang together as a connected argument. 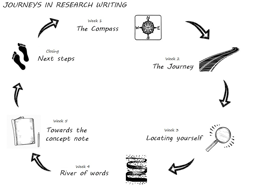 We also invite you to think differently about the process of writing your research. You will select a specific writing product – one relevant to your current needs, such as a concept note, a proposal or a literature review - around which to focus the writing exercises over the five weeks. If you are at the beginning of your research journey, you may choose to do a concept note, which is a flexible document that would be useful early in the research process to help clarify your ideas to yourself and others. The course site offers a host of resources, videos, maps and tables to make your learning experience more engaging. Ideally, you will engage online with the others doing the course, share your thoughts and writing to form an online writing community. A skilled writing guide will respond to your work, particularly in the early stages of the course. We also encourage you to create your own group to work through the course together.